Yorkshire Cancer Research has funded a research study called the Leeds Lung Health Check. We hope the study will show that Lung Health Checks improve lung health. The Lung Health Checks include screening scans for lung cancer, as well as other types of lung disease including COPD. Screening is available in some countries like the USA and Canada but is not yet widely available in the UK. The committee that decides on screening in the UK is considering Lung Cancer Screening currently, and it maybe that this is rolled out across the UK in future. You may receive an invitation from your GP inviting you for a Lung Health Check. Invitations are being sent through the post throughout 2018 - 2020. Will everyone in the Leeds area get invited? Not everyone will be invited for a Lung Health Check though the study team will look at what happens to the lung health of people who are invited, compared with a control group of people who are not invited. The control group will also include people aged 55 to 80 who are current or former smokers. The study will follow both groups throughout their lifetime. What are the reasons that I may not be involved? There are several reasons you may not have been invited for a Lung Health Check. It could be because your postcode area is not part of the programme. You may be in the control group who will not receive an invitation. Or you may not have received your invitation yet, and you will get one in the future. I've heard data collection is used in this study - can I opt out? The study team will collect data from GP and hospital records to measure how effective the Lung Health Checks are in improving lung health. This will involve collecting information from people invited, and those in the control group. Your information may be used by the study team without them contacting you, either if you are in the control group, or if you did not reply to your invitation. If you do not want your information to be used in this study, you can opt out by phoning 0113 343 3623. You can also e-mail leedslunghealthcheck@nhs.net or write to “Leeds Lung Health Check, Leeds Chest Clinic, Leeds General Infirmary, LS1 3EX”. Opting out will not stop you being invited for other NHS screening services. Thank you for finding out more about the Leeds Lung Health Check. 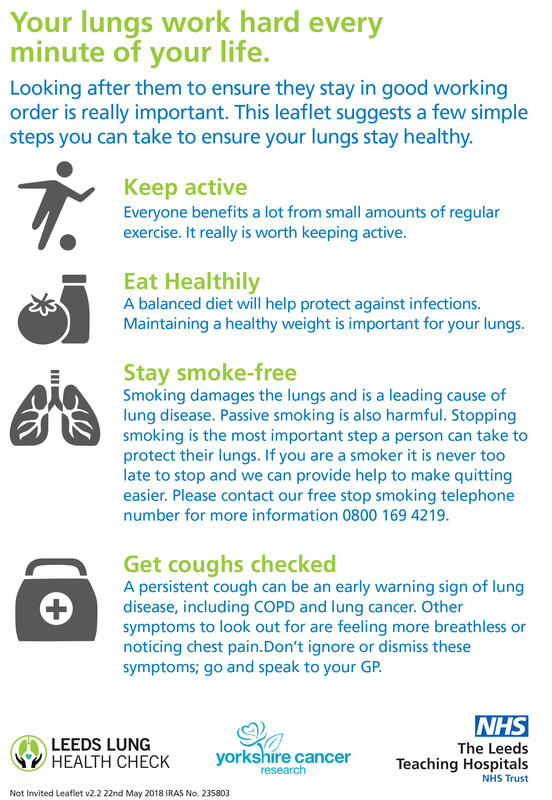 Here are some more ways you can look after the health of your lungs.